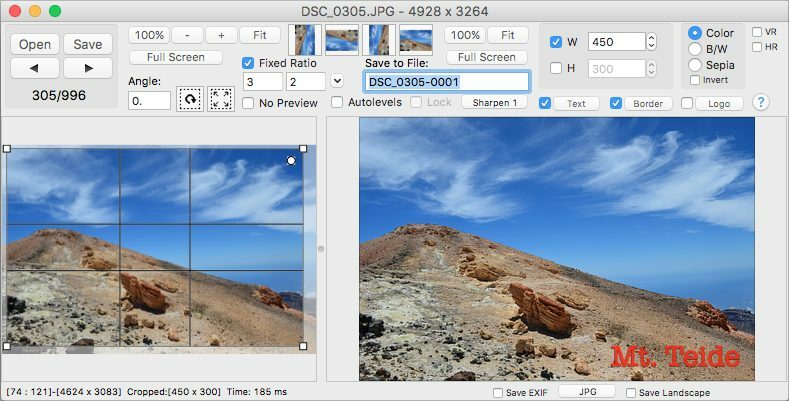 Click 2 Crop - the fast and easy photo editor for macOS. Click 2 Crop is an easy to use photo editor designed keeping one thing in mind — Speed. Click 2 Crop enables you to crop, resize and optimize your photos very fast, within a few mouse clicks. It has a simple but very effective crop tool that lets you preview the result while you're editing the image. You can crop the image to remove unwanted areas of the frame or to create a zoomed-in effect, and can view the output on the fly while you're doing these edits. Why do you need Click 2 Crop if you already have at least two great application Preview and Photos? Let's face a very real-like user case: imagine that your friend comes to you with a thumb-drive full of photos (500 photos) of his latest vacation in Rio. He wants to see these photos with you. Also, he asks you to help to find and prepare a few best photos for printing and for display them in a digital photo frame. Preview is good for viewing and editing separate image file. When you need to browse through a folder with 500 photos you will not be comfortable with Preview. Photos are great for storing, collecting and editing. There is only one problem. To view and edit photo with Photos, you need to add it into *your* Photos library. Are you sure that you need the whole bunch of your friend Rio adventures at your Photos library? There are many other cases when you need to view or edit photos, but don't like to keep all these photos on your computer in the future. With Click 2 Crop you may fast and easy browse through folders full of images, view these images, crop them and save selected images in separate location of your choice or add them to Photos. With Click 2 Crop you may fast and easy select and prepare 100 good photos from 2000 taken shots. Designed for macOS 10.13 High Sierra. Requires Mac OS X 10.6 or later. Why Click 2 Crop is faster than any conventional photo editor? Click 2 Crop saves you from all unnecessary actions. You don't need to open every file. Open just first file and use Next button or Page Down key for opening following images. You don't need to select names for saved files. Select a name while saving only first file, all other files will be saved into the same location with automatically incremented names. You don't need to call for cropping tool. When file is opened, cropping frame is already there. It's on the same place as it was on the previous image and it's especially great if you are editing photo serials. All necessary controls like cropping frame aspect ratio, position and rotation, output file size and so on are within a one click distance. No more menu searching and endless dialogue popups. Everything are here on the screen. You may use a special Cropping Guide Lines that help you to crop and compose nice balanced images. You may resize cropped images to the needed size. You may add line borders and text captions to your cropped images. You may use Auto-levels, Sharpening, Black and White, Sepia and some other effects on the fly. Click 2 Crop is a handy software solution for both professional as well as amateur photographers, for bloggers, for online sellers in auction sites like E-Bay, Amazon etc., for Web designers, CMS applications users, for the casual home users editing and sorting their scanned photos etc. If you are a Professional Photographer - you will be able to quickly browse through your last photo session, sort out good and bad shots, correct the photo composition, add your copyright mark and/or studio logo, prepare low resolution versions or thumbnails for online showcase etc. If you are an Amateur Photographer - you can quickly and easily correct your photos, add date, location description captions to your honeymoon vacation photos, add borders, make small size versions of the photo for email, prepare photos for printing etc. If you are an Online Seller - You can easily make attractive images for your auction items gallery with only one click per photo. Click 2 Crop is created by Mazaika.com, producer of one of the best Photo Mosaic program Mazaika. We needed small, simple and effective software for manual cutting of hundreds of large photographs into thousands of smaller images with simple content. 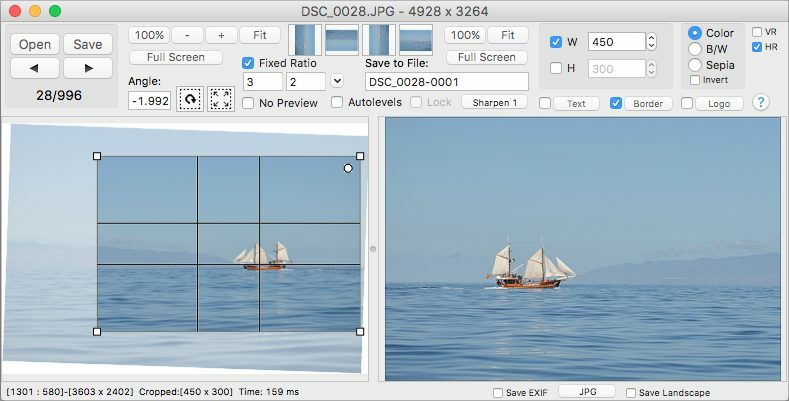 The initial version of Click 2 Crop was designed for this task only. But its user interface was so simple and efficient that people who used Click 2 Crop for their photo mosaic projects wished to keep using Click 2 Crop as their general purpose photo editor and viewer.